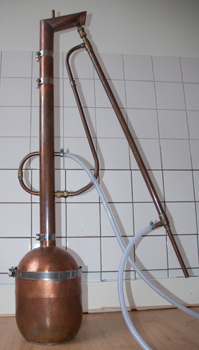 The small distillator was build for expiriment purposes, its size is suitable for a normal kitchen. The machine made to be editable for differernt purposes, with several culumn-heights, and 2 seperate cooling systems. Materials: copper, stainless steel, food-grade plastic tubes.